IT has been almost two months since the launch issue of Army&You landed on doorsteps up and down the country and we have been delighted to receive your feedback on the new magazine for everyone with a soldier in their life. Just wanted to say thank you so much for your informative magazine. I read it from cover to cover. As a parent with a son in the Armed Forces there is little or no information for us. So once again thank you. I have been speaking to Lee Jay whose part of the Welfare Team for 1 Anglians, he was at a meeting yesterday in London where the new Army&You had fantastic reviews. The Chairman of the meeting thought it was brilliant and a fantastic source of information. Just wanted to say I really enjoyed reading the magazine and have learnt so much from it! Can’t wait for the next issue! Forces Sauces salutes @ArmyandYou for this honourable mention in the autumn edition of Army&You magazine! 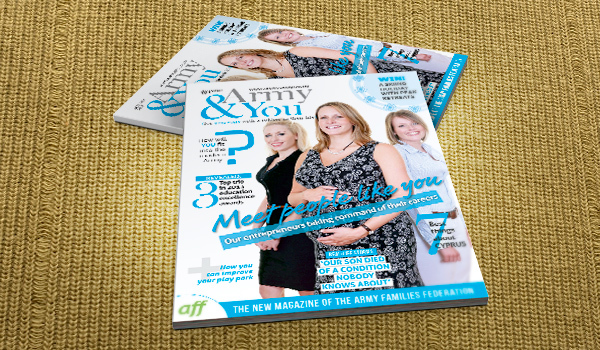 We have had such positive feedback about the article in @ArmyandYou magazine! Thank you – it’s wonderful to spread the word! Just a quick email to say how much I enjoyed reading the first edition of Army&You. It’s a great glossy with lots of interesting articles. We love the Corporal Ketchup and Brigadier Brown and will be heading to Tesco shortly for a quick purchase!! Thank you so much for publishing the article, already it has generated lots of interest. I have just had a look at Army&You online and it is a brilliant replacement for the much-loved AFJ. Well done to Charlotte for producing such a lively, colourful and informative magazine. I am very proud to have played some very small part in the development of AFF. You are an extremely professional organisation nowadays – well done. Just wanted to let you know I received the copy of the magazine – we’re really happy with the result and hope you get lots of families interested!! Look forward to sending the lucky winners away! Mine has just arrived too – looks great! Very good comments in Northern Ireland too. I was very happy to see a magazine of this kind in the NAAFI and very surprised. A magazine like this “for everyone with a soldier in their life” is very much needed. We wives especially need all the support we can get. All the articles were very interesting, informative, reassuring and also encouraging. As a new “army wife” it has been a very difficult journey for me. Newly married I decided to move to be with my husband and within a matter of three weeks he was deployed. With no family support around, being all by myself is very new to me and sometimes with the men away, you feel like you’re doing everything all on your own. I look forward to more interesting articles and information on what is happening in the army community as many of us are at a loss as to what is going on. Keep it coming. I think their [AFF’s] magazine is brilliant… I always start reading it going, “oh no, another military magazine”, and then so much of what they have to say is so relevant, obviously to my life, that I end up reading the whole thing cover to cover. So I’m a great admirer of theirs. I just wanted to say what a great magazine this is, I picked up a copy outside our post bunk thinking it would be the usual type of thing, but when I read through it I have to say I thoroughly enjoyed it. Lovely layout, great pictures and excellent articles. Thank you very much for an informative and enjoyable magazine. I picked a copy up the other day and it’s great! Well done AFF on a superb new magazine. I wanted to congratulate you on the first edition of Army&You and also thank you for featuring RBLI’s grant from the Armed Forces Covenant Libor Fund on the website. After seeing an article in the new AFF magazine I decided to contact the MOD play parks co-ordinate to make them aware of our situation down here – play park badly vandalised and state of disrepair. A technical officer from MOD called this morning to say that, together with AWS, they are trying to get funds to replace the play equipment in the park!